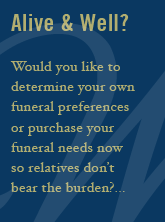 Wilbert Funeral Services, Inc., a subsidiary of Wilbert, Inc., was originally founded in 1893 in Chicago, IL. It is the largest single source supplier of concrete burial vaults and cremation related products and services in the world. Through its strategically located distribution warehouses, the company serves over 18,000 funeral homes, cemeteries and crematories in North America. In fact, every 49.5 seconds, every day of the year, a family chooses an outer burial container made by a Wilbert® licensed manufacturer. From famous celebrities such as Louis Armstrong and Elvis Presley to American Presidents, Eisenhower, Kennedy and Nixon, Wilbert has become recognized for providing the finest products in the death care industry.